It's been a lean month for painting, but finally I have something to post. 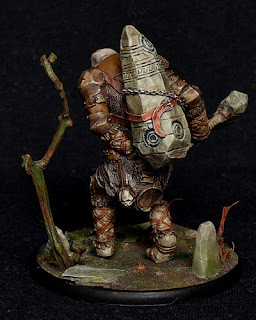 It's Urbad Vagrant Oghurithne by Mierce Miniatures, part of their Darklands range. I picked this up as part of their kickstarter earlier in the year, the best kickstarter experience I have had. The models turned up within three months of the end of the project, with no delay, no problems, no customs hassles (but that's a different story for a different day). The figure was part of a big package of goodies that is still waiting for my attention. I will probably get to use some of the models in my chaos army, but I just fancied painting something non-wargaming related for a change of pace. 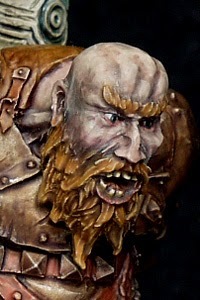 I noticed that WAMP were running an online painting competition, so I went for this guy instead. I spent a bit of extra time on the base and face in particular, the latter I wanted to portray an older look, hence the grey washes and the age dots on his head. I will be writing a review of some of the other figures included in the kickstarter at a later date, hopefully sooner rather than later. The short version is - they are superb models, top quality casts and lovely sculpts and they come highly recommended. Hopefully I will be able to squeeze some more in before long. It seems that Avatars of War are switching from resin/restic to injection plastic moulded figures. 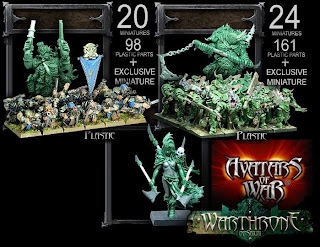 They recently introduced plastic Dwarf rangers to their product range and kicked off with a special offer of a promotional figure and a discount on the first 200 boxes. Now they are making a similar offer on dwarf gunners and warriors of apocalypse corrupters. There's also a new metal figure release too. Full details on the Avatars of War facebook page. I was a big fan of Avatars of War, I bought and painted up their plastic dwarf berserkers (shown here) and have several of the metal figures in various armies. I pledged to their indiegogo campaign too, though only in a small way - the army standard bearer. But that's when things started to sour a little, as delays and lack of updates plagued the project. Reading between the lines, I guess they had some real production problems casting up their sets in the new wonder material, plastic resin, which was obviously cheaper to start up with than plastic injection moulding, but has cost them many problems in the longer term. I much prefer plastic to restic, so am tempted by these new boxsets, but find myself with a little dilemma. I don't play warhammer much these days, but these figures are really nice. Should I buy them and hope that I can resurrect my interest in the game (or find a decent alternative), or should I continue to explore new gaming systems like Saga, Lord of the Rings, et al? I prefer other gaming systems to warhammer, but I still love the fantasy genre minis best of all and get most enjoyment out of painting them. 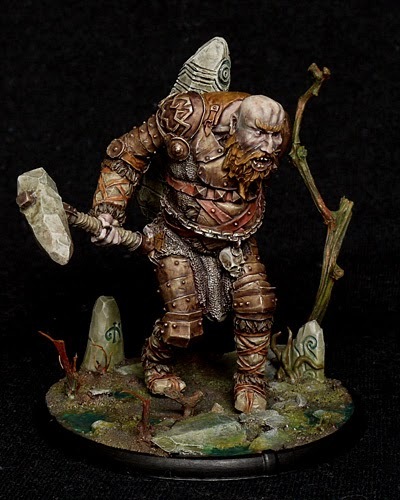 I am always on the look out for alternative minis for my Warhammer collection, the official figures are increasingly out of my price range and lacking in the detail and aesthetic that others can provide. A good example is this very striking vampire lord from The Russian Alternative ebay store. It's a lovely looking figure, with detachable wings and an alternative head. The price is a very reasonable $12.50, which at current exchange rates is about £8. Shipping adds a further $7, so a total price of around £12 for UK customers. That's comparable with most of the quality ranges these days, which in my book contains Avatars of War, Mierce Miniatures, some GW stuff (if you can find the old metal figures) and some of the more exclusive boutique figures like Enigma and Studio McVey. There is the option to buy several figures from the ebay store and thus save on postage. I was impressed by most of the range, but these other two sculpts caught my eye. The chaos figure would perhaps give me the impetus to finally bring my years-old Tzeentch warrior collection into line with my more recent warriors force - rebasing would be required but I am considering doing this anyway. 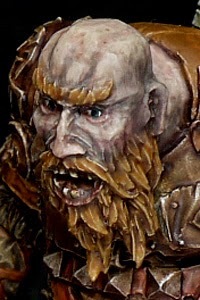 The dwarf would be purely a painting project, I have not played the dwarf army for about two years. All images are used without permission, but I hope the owner does not mind (in the highly unlikely event that he knows about my blog)!